In the near future, all of us will be living alongside, or be one of, the largest group of older persons New South Wales has ever seen. This population ageing, seen worldwide, will change the face of ageing in New South Wales. In this article Stephanie Hull looks at ageing in New South Wales and touches on what this means for Inner Sydney. In 2014 there were more than 1.1 million people aged 65 years and over in New South Wales and 67,000 in Inner Sydney alone. In this article Inner Sydney refers to the local government areas of Botany, Leichhardt, Randwick, City of Sydney, Waverley and Woollahra. Historically, we’ve never had this many older persons. This number is projected to increase as the large Baby Boomer and subsequent generations continue to age. Between 2004 and 2014, the number of people in the seniors’ age group grew rapidly across all parts of the State. The increase varied from 24 per cent growth in the Far West, to as high as 46 per cent in the South East and Tablelands. Metropolitan Sydney was not exempt. Its gain of about 139,000 older persons was an increase of 31 per cent. Inner Sydney gained 11,300 older persons, an increase of 20 per cent. Not only will there be more people aged 65 years and older, but they will also make up an increasing share of the total population. Our population projections show that this group is likely to increase from one in six people, to one in five by 2031. In some parts of NSW, one in three people in the population are already 65 years and over. Inner Sydney is relatively young compared to other parts of NSW, that is a larger share of the total population is found at young ages. This reflects the continued migration to Inner Sydney from overseas and other parts of Australia for students and early career workers. 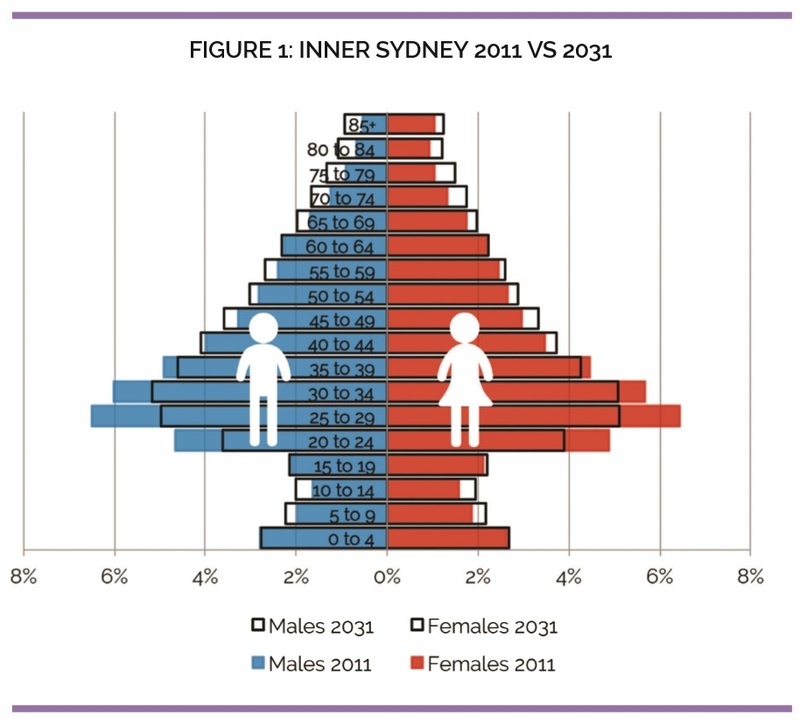 All age groups in Inner Sydney are projected to grow between 2011 and 2031. Population growth will be slower for young adults compared to other ages, and they will make up a smaller share of the population in the future (see Figure 1). Inner Sydney’s share of older people is likely to increase from 1 in 9 people, to 1 in 7 by 2031. Older people are expected to increase at the fastest pace and make up an increasing share of the population. This growth in older persons will continue as we, our family, friends and neighbours continue to age. We are in the midst of changing history! A new population pattern is emerging across Australia, namely a greater number of seniors than children and youth (see Figure 2). This pattern can already be seen in some coastal regions and will likely be seen across all parts of the State, outside of Metropolitan Sydney, as early as 2021. Due to larger numbers of younger people, Inner Sydney won’t see this same shift until 2031. Population ageing means every community is going to change. Ageing will impact all aspects of social and economic life in terms of labour force, demand for housing, goods and services, aged care and public spending. An important implication of the increase in the number of older persons is a steady decline in the ratio of older persons to those of working ages (defined here as 20-64 years). Over the past 20 years or more we’ve seen a reduced number of people of working age for each person aged 65 and over. It’s fallen from five, to four people between 1991 and 2011, and is projected to reach three working age people per older person by 2031. For Inner Sydney, more young people mean a higher ratio of working age to older persons. From 2011 to 2031 the ratio is expected to fall from six/seven to five workers per older person. This will have implications for the diversity of the workforce, and could have implications for employment in those industries that service the needs of the population who have retired. Looking at the population by age gives us an idea of the impact of ageing on the labour force. The number of people under 15 show the potential number of entrants into the labour force. Counts of people in the ages prior to retirement (50-64 years) indicate the potential number of exits from the labour force. 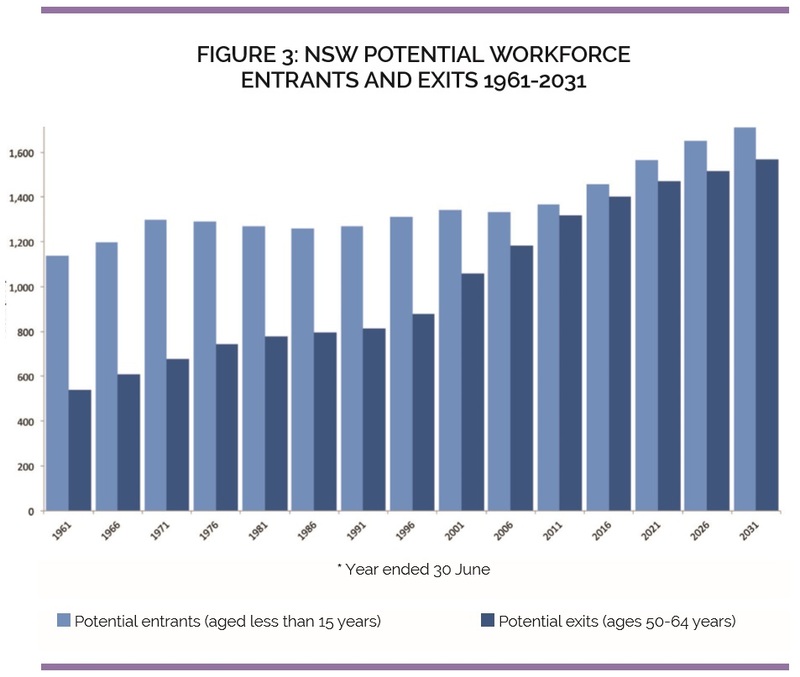 Historically New South Wales has always had a growing labour force as more people entered than exited the population defined as working age (Figure 3). 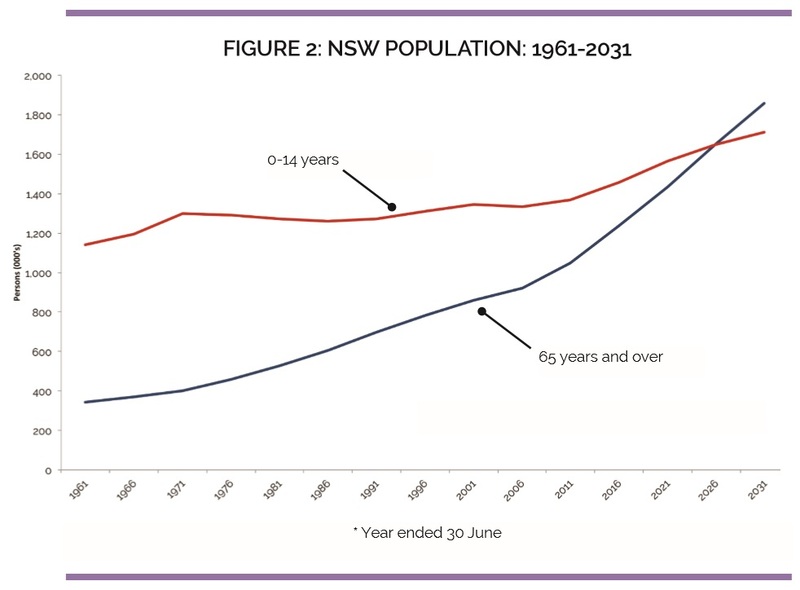 In New South Wales, even though the size of the working age population is projected to increase, its share of the total population is going to decline. The same is true for Inner Sydney. Workforce planning is needed to account for this mismatch between the share of the population in the labour force and those out of the labour force while maintaining productivity, economic growth and standards of living. Population ageing is an Australian success story built on an increase in life expectancy. Australia has one of the longest life expectancies in the world. People are living longer than was previously the case and are projected to continue to live longer into the future. But an increase in life expectancy doesn’t necessarily mean we will be “old” for longer. Healthy life expectancy is also projected to increase with persons at age 65, on average, gaining more years of life, without severe or profound core activity limitation, than with it. This ‘active ageing’ presents opportunities for older persons to continue to participate in the labour force well into their 60s. The Commonwealth Government’s 2015 Intergenerational Report predicted strong increases in participation rates among those aged 65 and over, from 13 per cent in 2014/15 to 17 per cent by 2054/55. Policies and infrastructure put in place to support older persons who want to work will help ease some of the stress that an ageing population would otherwise put on economic growth. This will also help to maintain stability between the size of the populations in and out of the labour force. Workplaces will benefit from the wisdom of people with significant work experience. The 2011 Census shows that seniors are already active, and that there are differences between those aged 65-74 and those 75 years and over. The youngest seniors are participating in the workforce with one in six either employed or actively seeking work. Just one in 33 people aged 75 years and over are in the workforce. Many seniors also volunteer. One in five people aged 65-74 and one in eight people aged 75 years and older contribute to the community through volunteering. This group of the population are therefore important members of the communities in which they live. Most older people are physically active, however, the need for help with core activities does increase with age. Help is needed among one in 11 people aged 65-74, and rises to one in three for those 75 years and over. With the present patterns of increasing life expectancy and high activity levels, it will be interesting to see in 10 years’ time if someone aged 65 will be seen as an “older person”. Population ageing reflects a great success story for Australia’s public health system. According to the General Social Survey of Australia conducted in 2014, older Australians are the most satisfied among the population. When asked to rank their level of overall life satisfaction on a scale of 0-10, persons 75 years and over were the most satisfied. Almost half of them responded with a nine or above compared to just 30 per cent for the population as a whole. Australia is also a good place to grow old. To see how we rank globally in terms of how well our older people are faring, check out the Age Watch Report Card. Stephanie Hull is a Demographer with the Demography Unit at the NSW Department of Planning and Environment.